Greetings, readers, and welcome back to another set of book reviews! Now, before we get started, I have a confession to make, a terrible secret which I suspect some few of you may share. You see, I’m almost pathologically incapable of putting down a good book, even (and especially) when it’s supposed to be my bedtime. The bedside lamp goes that peculiar shade of the gravedigger’s hours, the clock reads a time my morning self is already cursing about, and yet I cannot stop reading. “Just one more chapter,” I tell myself, “one more page, just to see how this plot point gets resolved,” and then it’s not quite night and not quite morning, the book is somehow done, and I feel like I should regret my decision but I don’t in the slightest. The reason why is simple. A good book transports you to another universe, makes you care about the characters within as if they’re just as real as your own life, causes you to lose precious hours of sleep searching for a resolution. A good book gives you the gift of an observer, privileged to share in its wondrous, fantastic story, and no matter the hour, the time spent is not begrudged in the slightest, for those dreaming hours you were lost in its pages, you were allowed to be a part of something else. All four of the following books kept me up much later than I was anticipating. 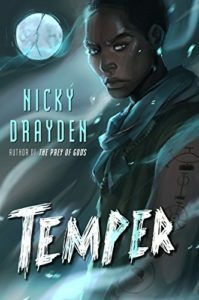 The first book I’d like to review is Temper, by Nicky Drayden. Temper is an interesting philosophical musing on the nature of sin and virtue, as well as the age-old conflict between fate and free will. The novel centers on a society built around the idea that almost every birth results in twins, but that each twin is marked with seven signs—a mixture of vices and virtues—and parents choose which child will bear more vices in order to improve the odds of the virtuous child succeeding. The protagonist, Auben, is marked with six vices and only one virtue, one of the lowest of the low, and his interactions with his twin, his family, and with society at large are both believable and complex, examining the life of someone told from birth the role he must play. As a starting point, I found this intriguing, and then the novel moves on from there in some highly unanticipated directions, such that by the end, I was more than a little impressed by the scope of Drayden’s concepts. The ending itself was of the type that immediately had me rethinking everything I had read, and I’m looking forward to going through Temper again with that knowledge in mind. Read if: you like Afrofuturism; you like creation myths; you want to keep Austin weird. Changing tacks slightly, the next book in this review is Noumenon: Infinity, by Marina J. Lostetter—a science fiction novel set as a series of seemingly unrelated vignettes covering a vast expanse of time, but by its end, a tale weaving together themes of conflict, exploration, and humanity’s drive to persevere, even against impossible situations. 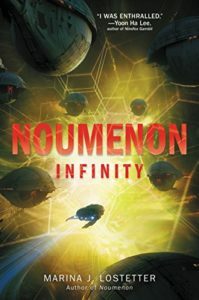 I really enjoyed the fragmented nature of Noumenon: Infinity, since it turns the book into easily digestible chunks that nevertheless form a cohesive whole once the last one finishes. It’s almost more a collection of short stories than a novel proper, which allows Lostetter to explore a myriad of ideas—some very old (work relationship dynamics), some very new (quantum-linked ancestral memories), and many in between. While this might seem confusing from an outside perspective, each chapter is self-contained enough that you can very much read them one at a time and still come away with an appreciation of what Lostetter was trying to achieve, making it an excellent book for those who don’t have long stretches of time to devote solely to reading. Another thing I particularly enjoyed is that Lostetter is not afraid to take risks with her worldbuilding, particularly in imagining alien (in the true sense of “not Earth-like”) encounters both internal and external. While a couple of these didn’t quite work for me, the vast majority did, and they add a sense of otherness to the story that’s rare in SF (since unfortunately most “alien”ness tends to be of the “humans in funny suits” variety). Read if: you like Peter F. Hamilton books; you like epic time-scale stories; you yearn to explore the infinite mysteries of space. 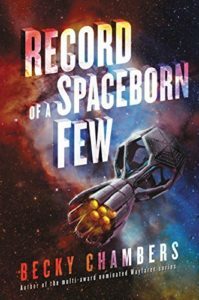 The third book I have for you is Record of a Spaceborn Few, by Becky Chambers. Superficially, this book is similar to Noumenon: Infinity, in that it takes place in space from the vantage point of multiple characters, but where I would categorize much of Noumenon’s appeal as an external, broad lens look at multiple issues, Record of a Spaceborn Few is almost a complete one-eighty, delving deep into the minutiae of humanity and grounding everything in detailed, loving character development. Were it not for the obvious SF trappings (colonists on a generation ship, highly advanced technology, the occasional alien), Record of a Spaceborn Few could just as easily be describing a small community anywhere on Earth, but it is a familiarity that is earned, not assumed. Each character grapples with complex emotional issues arising from a shared tragedy, as well as personal challenges oftentimes related to self-discovery—that the life they lead now may not be the life they want to lead in the future—but Chambers always keeps her characters grounded and believable, such that by the end of the book, I felt like I had gotten a glimpse inside several other lives. Chambers also does an excellent job of presenting different temporal viewpoints among her cast of characters. The teenager who acts like a teenager would, searching for meaning and self-expression in a stifling world of tradition. The young adult who loves her job, yet worries that it defines her, and suspects she’s missing some vital component of life. The middle-aged parent who worries about her children, fears for her financial stability, but is also concerned what trying something new might mean. The elder archivist who takes in everything that happens, intent on passing along her wisdom and ensuring a younger generation doesn’t forget how important the past is. All of these people are people, ones that you’ve likely met or have been at some point in your life, and Record of a Spaceborn Few does a magnificent job in capturing all the little things that make them so. There’s enough tension within the plot that it never becomes trite or cloying, which is another achievement all on its own, and after I finished reading the book I felt . . . satisfied. I suspect you will, too. Read if: you like quieter, slice-of-life novels; you like science fiction but don’t want to know how many megajoules makes the differential refractor polarize the thingamajig; you want to know how a body becomes soil. Finally, the last book I’d like to cover is The City of Brass, by S.A. Chakraborty. This book was initially released in 2017 as a hardback, and luckily for me (and you), is being re-released as a paperback. The reason I say “luckily” is that I have read a lot of books in my life, and this one ranks right up among the very best. 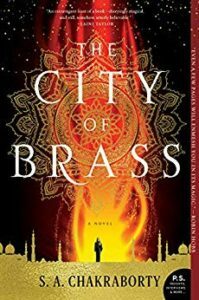 The City of Brass takes place in eighteenth-century Cairo, but quickly leaves our familiar world behind for a fantastical realm of ancient djinn and even older magic—Daevabad, the legendary city of brass from which the book gets its title. Daevabad, for all its mystery, however, is immediately recognizable as a city filled with all-too-human plots and schemes, whether it be the usurper king trying to keep his throne, the roiling discontent of an abused underclass, or the near open-conflict between religious zealots and those who despise them. It is clear from her writing that Chakraborty has done her research of the region, and it shows in the descriptions of both people and places, as well as societal norms and expectations. The two characters whose perspectives the story is told from are both fascinating yet flawed, leaving them plenty of room for future growth (or failure), and the secondary characters are all fleshed out with considerable depth, helping bring the world even further to life. I would be remiss if I also didn’t point out that The City of Brass has some excellent combat pieces, filled with clever swordwork, ominous magics, and terrifying mythological creatures. This is not just a dry, historical re-imagining of Islamic mythology—it is a rambunctious adventure that I think would make an excellent adaptation for HBO or Netflix or Showtime in the vein of American Gods or Game of Thrones, for those who prefer to watch instead of read (though you should also read it). If I’m waxing effusive about this book, it’s because it was really good, and I am personally very excited to see where this tale will lead. Read if: you like sweeping fantasy adventures; you like One Thousand and One Nights; you like something that isn’t standard Western fantasy. That’s it for this one, folks, and remember, when you have a good book, sleep is what happens to other people!